I am one of those unlucky people who was born with pin-straight short lashes, but thankfully a good mascara and an eyelash curler are always a quick fix for us ladies. I will be completely honest and share that I often notice when even men have longer and curlier lashes (insert a small hint of jealousy) and this true fact makes me want to try everything to get them to grow nice and strong. I have only tried one lash treatment in the past by Mavala (reviewed here), so I thought it was about time I give another a try. 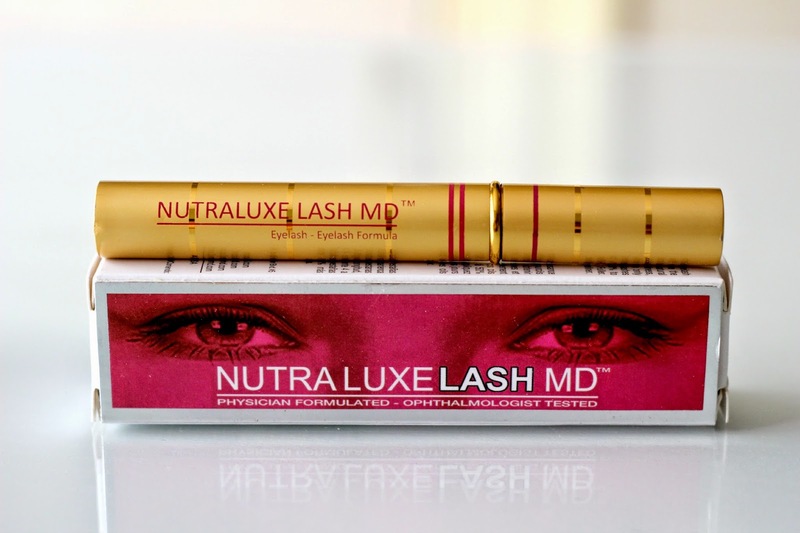 After doing some research, I went for the NutraLuxe Lash MD Eyelash Conditioner considering it had pretty rave reviews. After using it for a good couple of months, I am here today to share with you how this NutraLuxe product has been working for me. This product comes in 3 sizes, 1.5 ml, 3 ml, or 4.5 ml. I decided to purchase the smallest size since I did not know how well it would work for me. I got mine from Cleopatra's Choice since it was on sale from the retail $49 down to $34, including the first time $10 off coupon you get by submitting your email address. Compared to the popular (and expensive) RevitaLash treatment, it is just a fraction of the price so I figured why not give it a try. 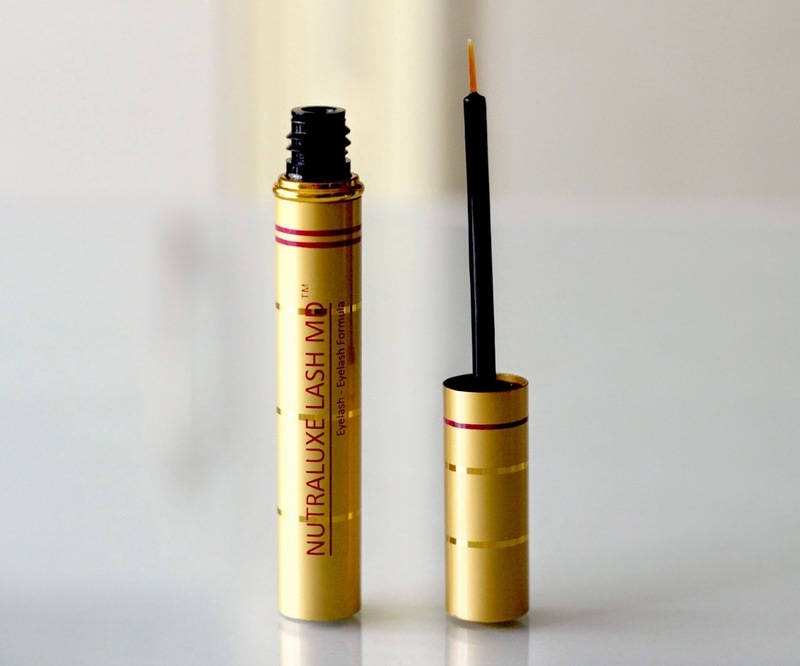 The product comes in a very luxurious-looking golden tube and includes a tiny brush tip for easy application, to be used at the base of the lashes at bedtime and applied in a similar way as you would eyeliner. It is formulated with Vitamins A, C, B3, B5 and E, grape seed extract, ginseng root extract, chamomile flower extract, and bearberry leaf extract, among other ingredients. A thin layer of this clear liquid is all that is needed, and one 'dip' is enough to go over both lash lines. It can even be used on your eyebrows. 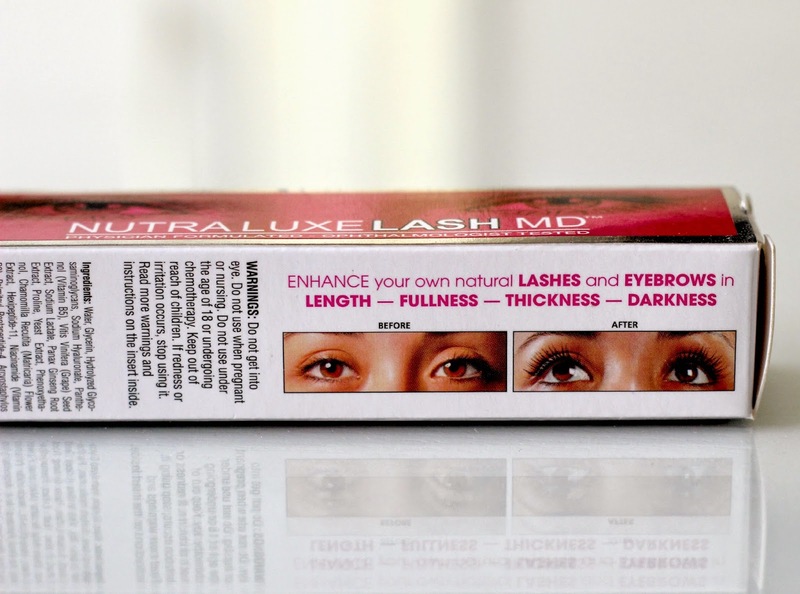 NutraLuxe claims that in 4 to 6 weeks, your natural lashes will improve in fullness, length, and thickness, and, wait for it, will become 30% to 50% fuller and longer! That is a pretty big claim right there, so I had really high hopes that it would work its magic on my lashes. I forgot to take a 'before' picture, but here is what my natural lashes look like after about 4 months of use. I definitely noticed the thickening of my lashes after a couple of weeks, but it's only after a month of daily application that I really saw a difference in length. I wouldn't go as far as to claim to they became 50% or even 30% longer, but they have definitely become much fuller and longer, and as you can see in the picture, my outer lashes have even started to naturally curl from their lengthening. However, I have also transitioned to a vegan lifestyle, so the growth in my lashes might also be attributed to me eating significantly healthier food (aka raw fruits and veggies in abundance, with a small amount of nuts and seeds). For upkeep, I now use the product every second or third day. I have experienced no stinging, redness, or any other sort of pain from use, which is always a big worry whenever using a product so close to the lash line. If you are looking for an eyelash growth treatment, I would still recommend trying this one since it might just work for you, although I would not expect dramatic results. It is relatively cheaper than other brands and despite buying the smallest size, it lasts a very long time. With no side effects from my experience, this is a trustworthy brand that might just provide you with the results you have been hoping for. Have you ever tried any lash growth treatments? What has been your experience? I have wanted to try a lash growing serum because I have short sparse lashes. If it also made them black I'd really be sold. Well this looks amazing! I have pretty thick lashes but who doesn't want more! lol. I just use natural moisturizers on mine before bed and that also helps.